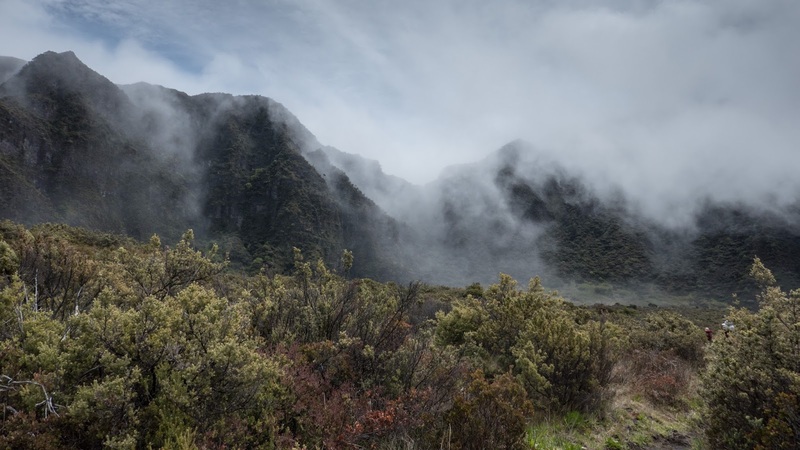 It's time for the final installment of photos from our recent trip to Maui (see here and here for the earlier posts). The "we" of the trip is the author, my husband, and our 20-year-old son. Sorry for the unmercifully long post! 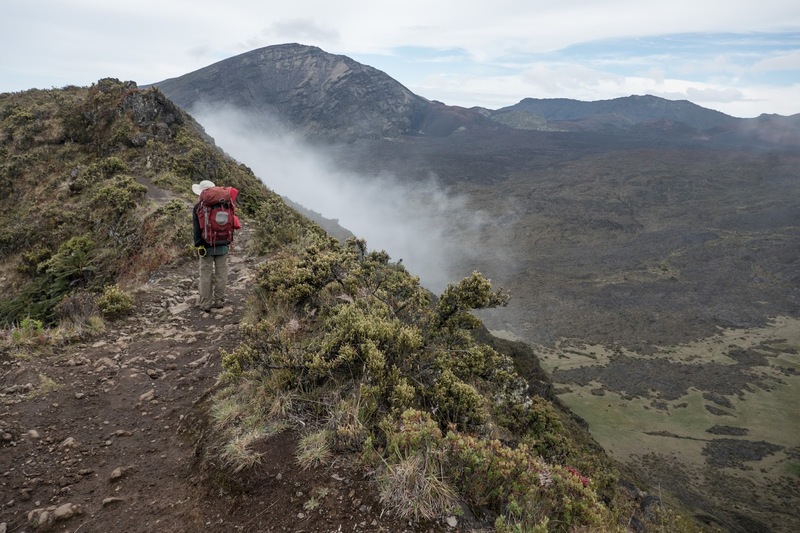 The primary objective of our Maui trip was a 3-night, 4-day backpacking trip into and across the Haleakala crater. Lots of people dayhike from the rim down to the crater (though we didn't see all that many--it's not a trivial hike, involving typically about 11 miles and a 1000' climb back out of the crater). 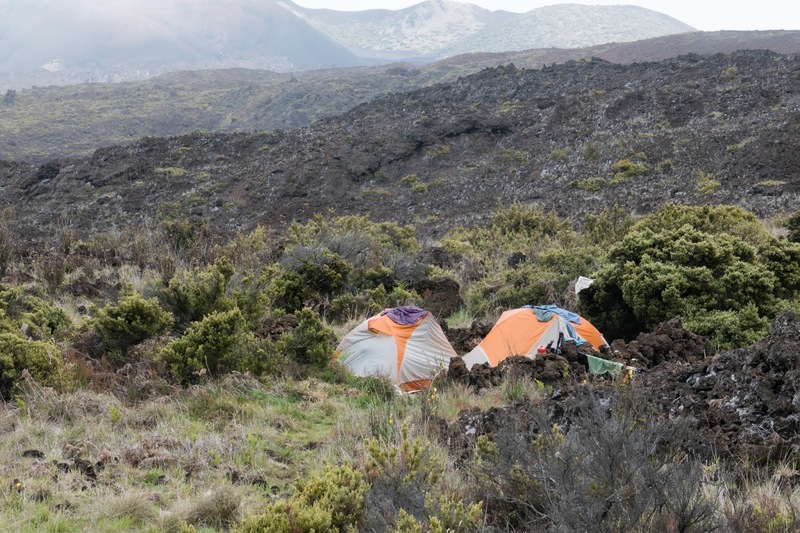 A few people each night use the 3 huts scattered around the crater, allowing them to eat and sleep indoors (and to carry less gear). Those of us who don't plan 6 months out get to carry our tents and do it the hard way. We started by picking up our permit (free, but required) at the ranger station near the Park entrance, then driving all the way to the summit. That was well past our trailhead, but we wanted to see the view, if any. At the summit, we got none, but just below the clouds opened up to give us a glimpse of where we were headed. 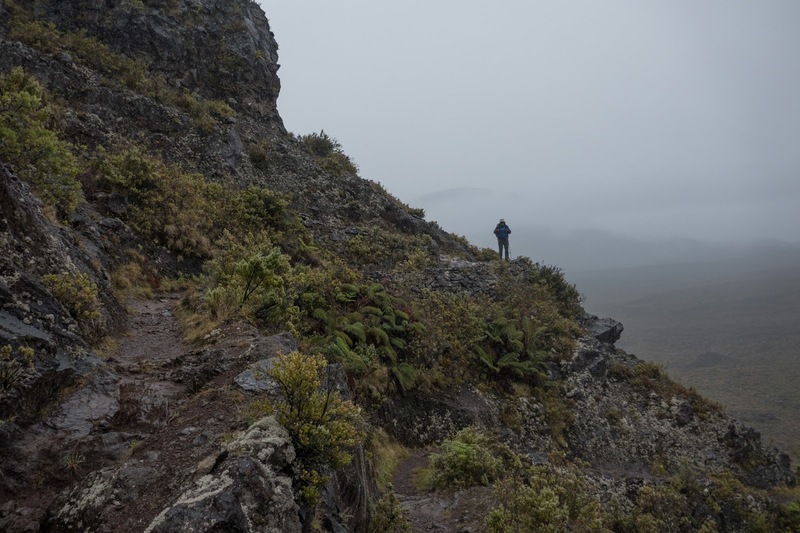 The weather cooperated reasonably well, and when we started our hike we could see what we faced. We have to go down there. 1000' down, in about 17 switchbacks. We made it down and across--and even back up a little!--to our campsite near the Holua hut. On this night, we shared the camping area with 2 other parties, but the remaining nights we were the only tenters. We set up camp, ate dinner, and enjoyed a subtle sunset before calling it a night. In the morning, the sunrise was as advertised--spectacular. Looking out through a gap in the rim toward the rising sun. We eventually turfed Eldest Son out of bed, and got back on the trail. It was about 6 1/2 miles across the crater to our next camp, and since we'd mostly been biking, not backpacking, we wanted an early start and plenty of water in case it got hot (spoiler: it didn't. We carried way too much water). 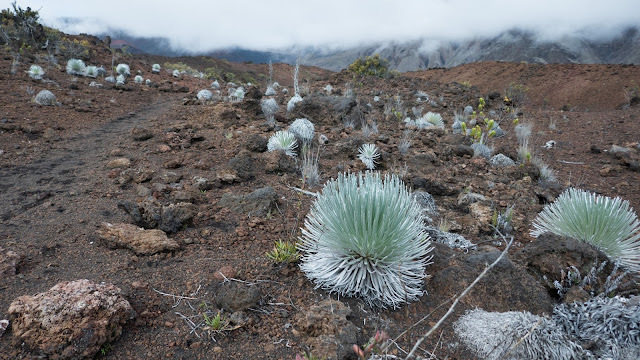 The trail climbed through a band of very broken aa lava, and we detoured a bit to check out the silverswords, an endemic plant (and different from the equally endemic and endangered silversword on Mauna Kea). It was the wrong time of year to see them in bloom, but the drought-resistant hairy leaves make them a striking sight regardless. Tiny hairs on the leaves reflect sunlight to conserve water, and give the plants their "silvery" look. 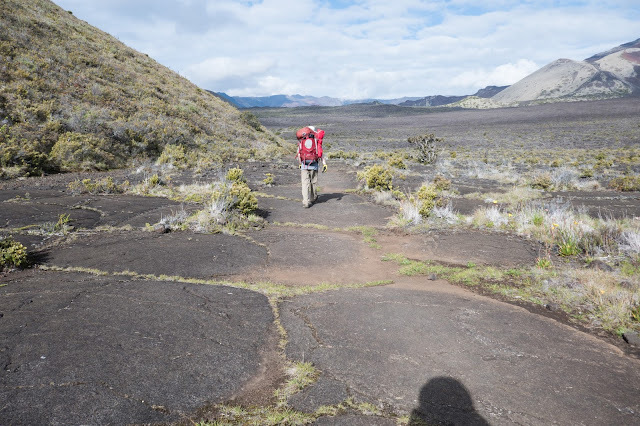 We gradually climbed up into an area of more cinders, making for a little smoother walking but also a little more work as the soft surface worked like sand. Eldest Son (in red) and the author head off up the trail. And I thought the bottom of the crater would be flat!). The terrain kept changing as we went, crossing endless cinder fields or lava flows from different times. The climate changed, as well, from the west end to the east. Easy to tell the old from the new. Finally approaching the east wall, and it looked like the misty mountains in a Chinese painting. The crater was a lesson in microclimates, since it was only 6 or 8 miles across the whole thing, but the weather could be very different one end to the other! The Paliku hut was nestled under the rim, and surrounded by tall, wet grass (I'm pretty sure the grasses are invasive, but the rain is wholly native!). 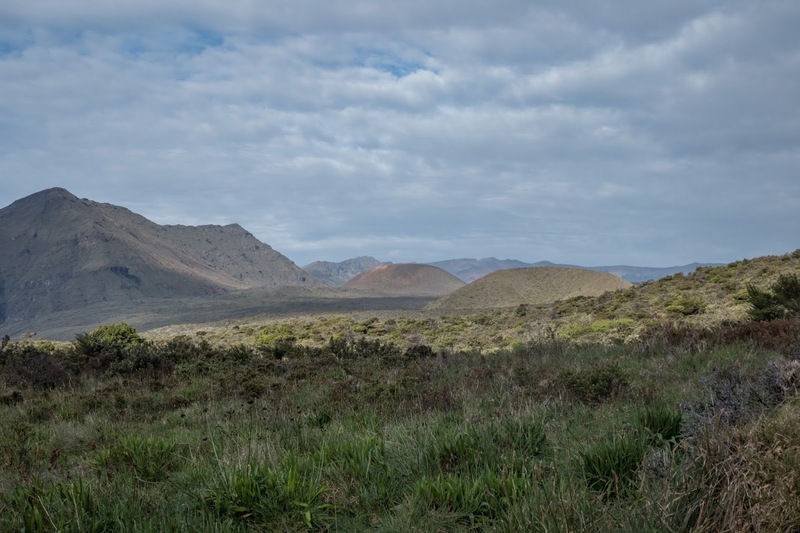 We got there in time for lunch, and selected a site near the hut and the trail to the outhouse, with a view out the Kaupo Gap. The sun eventually dried everything, until the evening dew soaked us all over again. In the morning, we packed up the wet tents and headed back out, to return to Holua via the Kapalaoa hut, which I think has the best views of the three, but doesn't have a tenting area. If I were to do the hike again, I'd try to plan far enough ahead to spend a night in that hut. A dry-looking morning. Heading back to the left of the small hills (we came in on the right). The trail was a lesson in the different kinds of lava. More pahoihoi. 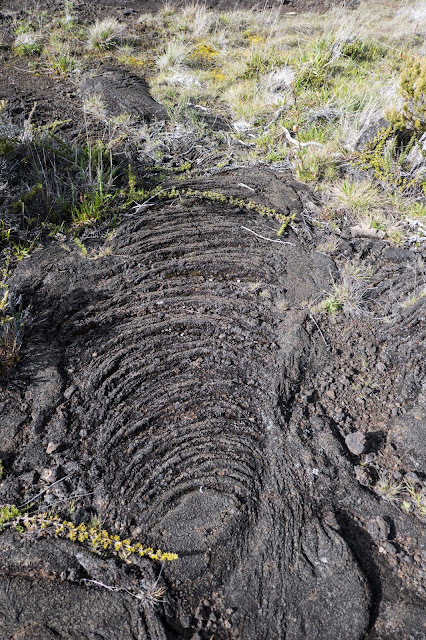 This might have been a lava dome. Aa--the rough and broken stuff. 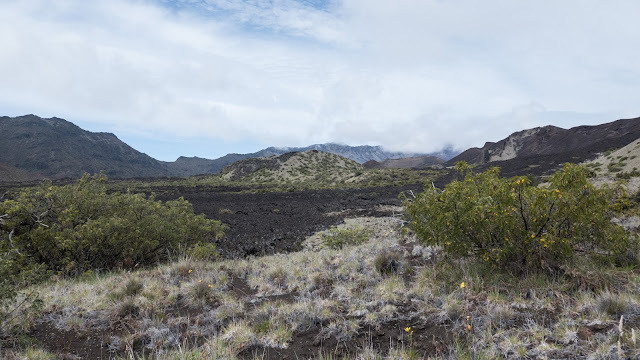 It was also along in this stretch that we realized that we could see the summits on the Big Island (which isn't really very far away--30 miles across the channel, though it's farther to the peaks), though not very clearly--the islands do attract clouds. 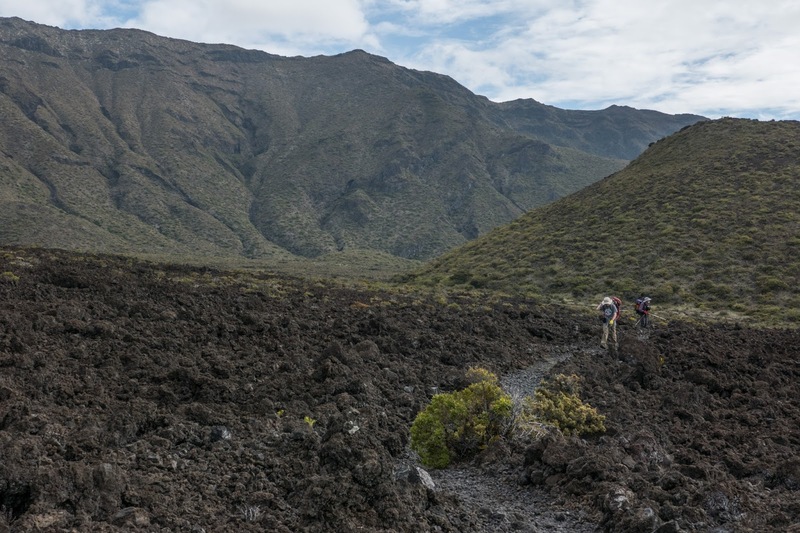 We crossed a divide, and were looking back at the colorful end of the crater. 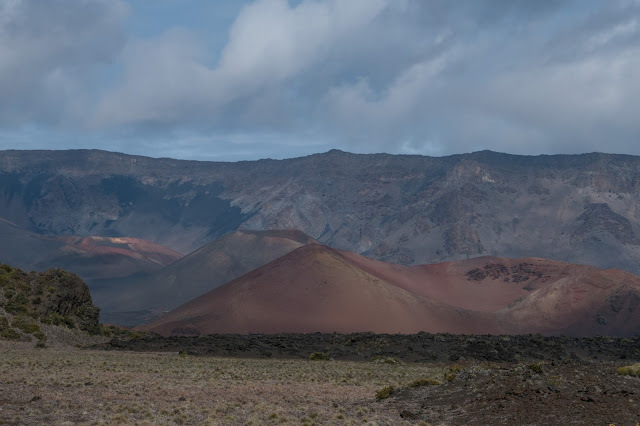 The contrasts of the red and dark cinders/lava made it a painted landscape. All these cinder cones have names. We lunched at the Kapalaoa hut, or at least snacked there. Every move was closely watched by one or more of the resident nenes. The nene (Hawaiian goose) is rare and endangered, with only a few hundred left, but you'd never know it around the Haleakala camps, as they have clearly learned that humans drop crumbs. 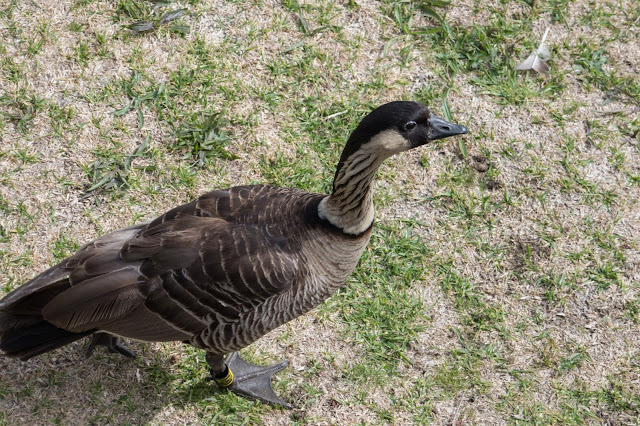 Every one we saw was banded and well studied, I'm sure. Nene pair for life, and most we saw were paired up. This one was either still single, or had lost his/her mate, because it was alone and thus all the more interested in us and our food. Back at Holua, we got a prime campsite, and settled in before it started to rain. We even got our hiking clothes mostly dry. Despite the desert-like vegetation, the crater is a pretty wet place. Tents make good drying racks, and clothes on top keep the sun from heating the tent so much. By midnight it had settled in to rain, and it didn't stop. In the morning we took shelter in the rangers' stable (they weren't using it, and there was an area open to entry) to cook and eat breakfast out of the wet. That was a nice luxury! The temperatures were pretty mild, so it was a toss-up whether to wear rain gear or not. But the rain did offer a few nice touches. 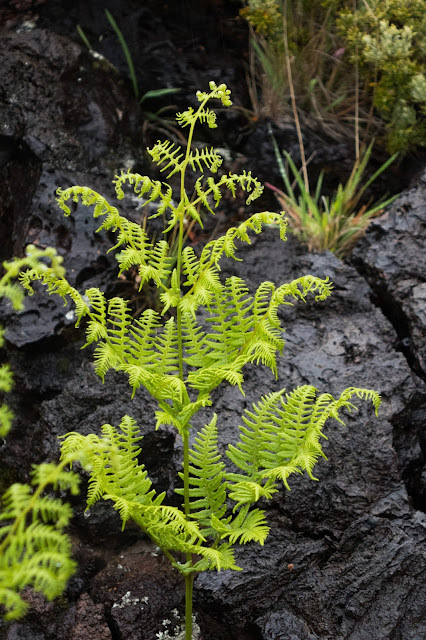 The rocks were extra dark, and the ferns extra green. Final shot, climbing the 1000' crater rim in the rain. I did find that when we reached the rim, the higher altitude combined with exposure to the wind to make me wish I'd worn my rain gear. Live and learn! Happily, the trial is wide and well made, to accommodate mules, so it wasn't scary even when wet. That was about it! We got out in time to get lunch and showers (at the beach) before Eldest Son had to catch his flight home (we got an extra day, not having as far to go, and used it to drive back to Kipahulu from the south--so maybe there's one more set of photos to be had from this trip). 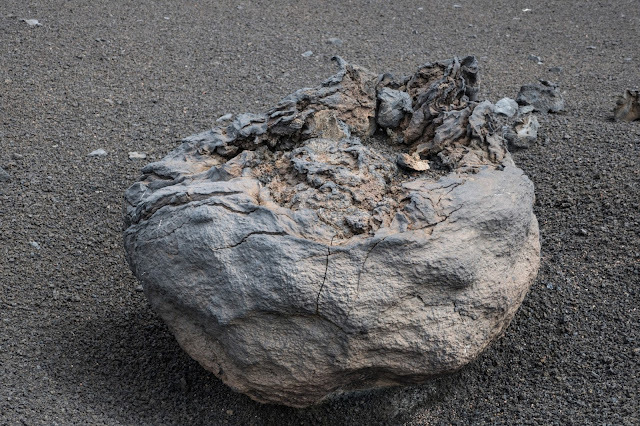 I'll leave you with one last picture, which I'm pretty sure is of a troll egg. Maybe this is where Gorg the Troll was born. Okay, actually that would be a lava bomb. Those are awesome pictures. Makes me want to go back to Hawaii and visit again. Thanks! I'm always amazed at the wide range of landscapes in such a small area, but of course 10,000+ feet of elevation change can do a lot! I learned those as a child of 3 at Craters of the Moon National Monument in Idaho :) I gather I was rather fond of the sound of "ropy pahoihoi." What a wonderful experience - one I will never have (carrying lots of gear and camping are not for me) so I enjoyed seeing the landscape through your eyes. A fair number of my friends do their backpacking vicariously through my photos :) It's not for everyone, but it keeps me sane to spend a few nights in the wild every now and then. This looks like an amazing experience. It sounds like you learned a lot too. Such beautiful and interesting terrain. Thanks for sharing your experience with us. Loved the pictures! We always like to get the flora and fauna guides, and learn a bit--which we usually forget, but doing the trip reports helps me cement a bit more of the knowledge.